After seeing and hearing about last years inaugural Torino – Nice rally we decided it was definitely on our ‘to do’ list. We managed to be organised enough to book our flights to Italy and our first nights accommodation in January and then we promptly forgot about it. Fast forward to 2 weeks before the event and suddenly we’re randomly picking our route from the cue sheets, planning a route from Milan airport to the start and throwing stuff into piles on the floor- no kit grid photos here! As events go the TNR is a little different to most, there are no winners or losers, no fixed route to follow, just a series of GPX files that take in a series of POI’s (points of interest). It’s mostly up to you how you string them together, on road, off road, flatter, hillier, use one of the short cuts if running out of time or not. Start in Turin finish in Nice. Simple! 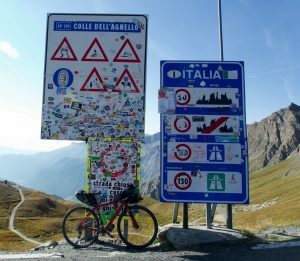 We arrived into Milan the day before the official start and got into the swing of things by riding the 130kms over to Turin. A pan flat ride this gave us time to warm up and sort out any packing issues before the ‘grand depart’. 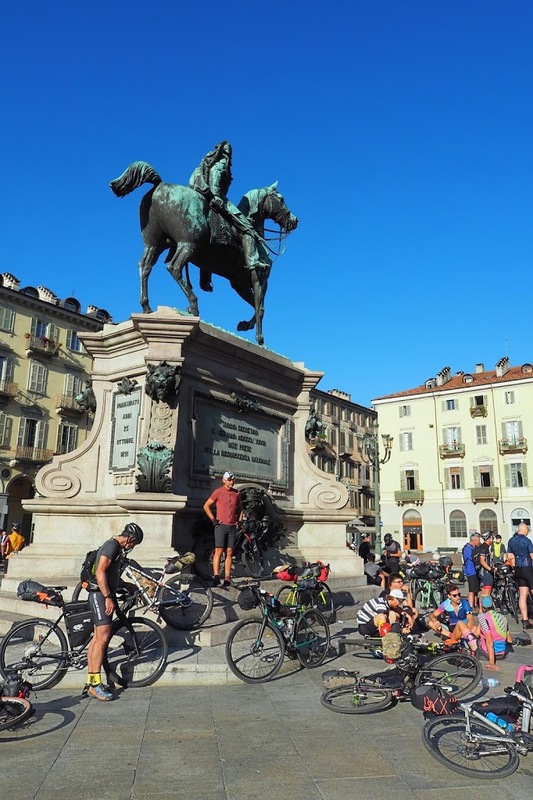 That evening 120 riders gathered on the Piazza Giambattista Bodoni for a meal of pizza, pasta and beer. It was great to catch up with lots of people we knew, discuss route options and weigh up other peoples bike choices. Day 1 Turin to Colle delle Finestre. 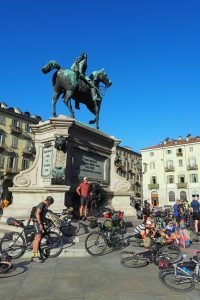 We gathered on the square next morning from 8.30 for a 9am departure, every conceivable type of bike was there, gravel bikes, cross bikes, mtb, mid fat, full fat, single speed there was even someone with a trailer who had broken off from their European tour to take part in the rally. 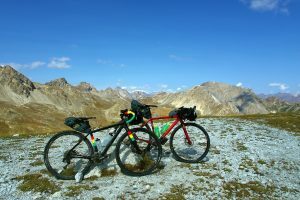 We’d opted for the lightweight combination of our Salsa Warbirds with minimal luggage, we knew there were some big climbs to come and wanted to make it as easy as possible – this was a holiday after all. After some group photos we rolled out of the square a little later than anticipated and made our way through the suburbs of Turin rather like a critical mass on vacation. For the first 224kms we’d all be following the same route, after that you started to make your own choices. It wasn’t long before we reached open countryside and the climbing began following roads that twisted through small villages, steadily upwards with many stops to refill bottles at fountains. 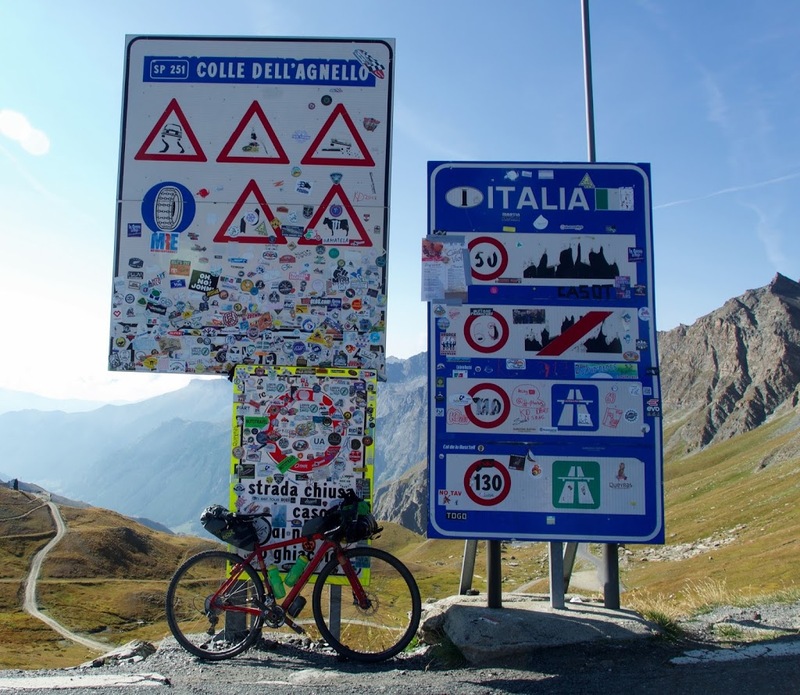 At 67km we turned off the road to start the first ‘big’ climb of the day the lesser known Colle Columbardo. Our first real taste of Italian off road it was lots of loose gravel and switchbacks eventually topping out at 2000m, it was also our first big grin inducing descent, fast, loose, sliding back ends and trying not to blow out tyres on water bars. First descent off Colle Columbardo. Eventually we rolled into Bussoleno as the only restaurant in town opened. Within an hour there must have been about 40 hungry riders stuffing themselves on pizza and calzones with more riders arriving all the time. We ate and decided to push on to get some more km’s done with very full bellies we headed off to start the the Colle delle Finestre climb. After a couple of hours riding into the dark and starting the first of it’s 54 switchbacks (yes 54!) we found our bed for the night, a small ledge above the road with some tree cover and bedded down for the night. Day 2 Colle delle Finestre to Chateau Ville Vielle via Col d’Izoard. A good nights sleep and we were off pre dawn to get some more climbing done before it warmed up. 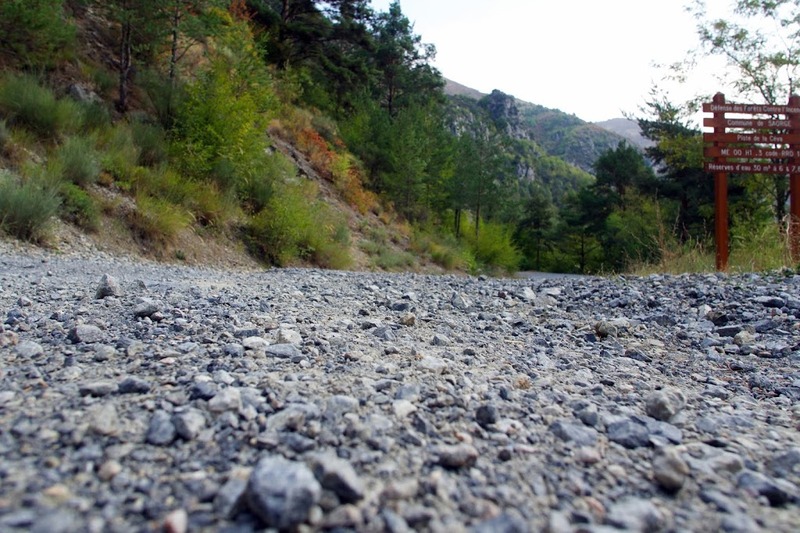 The tarmac on the Colle soon gave way to gravel as we rolled past more people sleeping trail side. We continued to climb steadily through tree lined slopes which eventually gave way to bare slopes and the sounds of the alpine cattle with their large bells. Eventually we topped out 2178m with 1750m gained climbing this one and from here it was a definite downhill to breakfast at the refuge. Coffee and eggs certainly tastes better after a long climb! After breakfast it was more strada and stunning views followed by a bit more road climbing on the Col Montgenevre before making our first crossing into France and heading to the walled town of Briancon to pick up more supplies before heading up the Col d’Izorad. It was early evening as we climbed up the Col traffic had died down and it now became a playground for the long boarders. As we winched our way slowly up they flew past us with a van behind to shuttle them back to the top. They must have managed a good 4 runs down the length of the Col in the time it took us to reach the summit. It was now starting to get dark so we popped on our lights, pulled on some warm layers and set off riding down over the graffitied names from this years Tour de France. We awoke early at the foot of the Colle dell’Agnello freezing in our bivvy bags and covered in frost. This climb was to be one of the high points of the rally at 2744m and at it’s base we were still pretty high and bloody cold. We soon started to warm up as we climbed the 30km’s up through the valley towards the summit. A couple of hours later we reached the top and another border crossing this time back into Italy, we celebrated with brioche and jelly beans before another fast road descent heading for Sampeyre. Obligatory high point- border picture. After a lunch of mozzarella and pomodorino paninis (sounds more exotic than cheese and tomato sandwiches) we felt almost human again and ready to take on another climb. 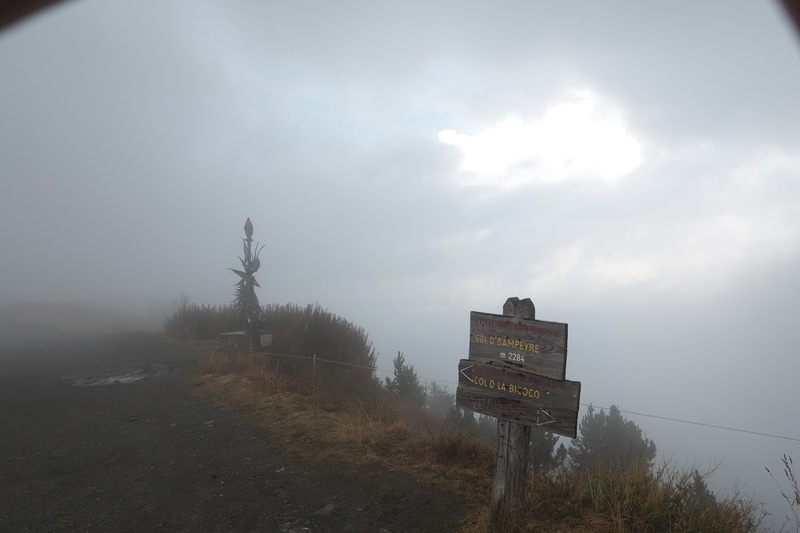 The Colle di Sampeyre was another 1320m climb topping out at 2284m, as we climbed it became very ‘muggy’ and we soon realised the weather was about to break and we were in for a soaking. Half way up the mist rolled in, the tarmac stopped and the Colle suddenly became quite eerie, we plodded on (though maybe a little quicker now) till we reached the top and found a sign in the mist showing our way off the top. 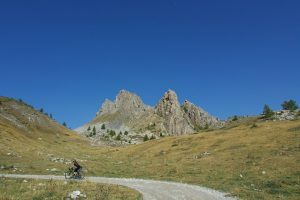 Topping out on Colle di Sampeyre. 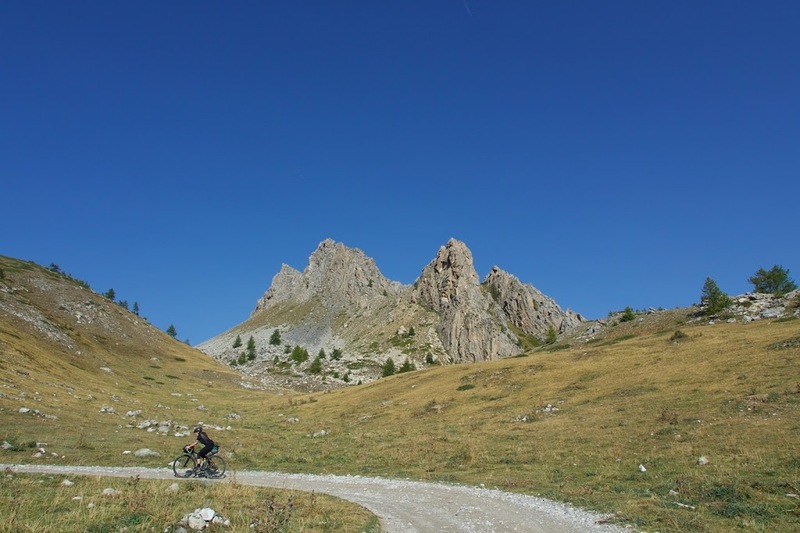 From here it was all downhill to the infamous Vallon d’Elva SP104, aka the ‘death road’. The ‘death road’ descends a steep-sided valley with tunnels cut through the rocks, for much of it’s length a bit of bailing twine is the only thing stopping you going over the edge and down into the gorge below and rockfalls and landslides are common. . We stopped frequently to take photos, this was one of the ‘must see’ points on the rally for us and we weren’t disapointed. 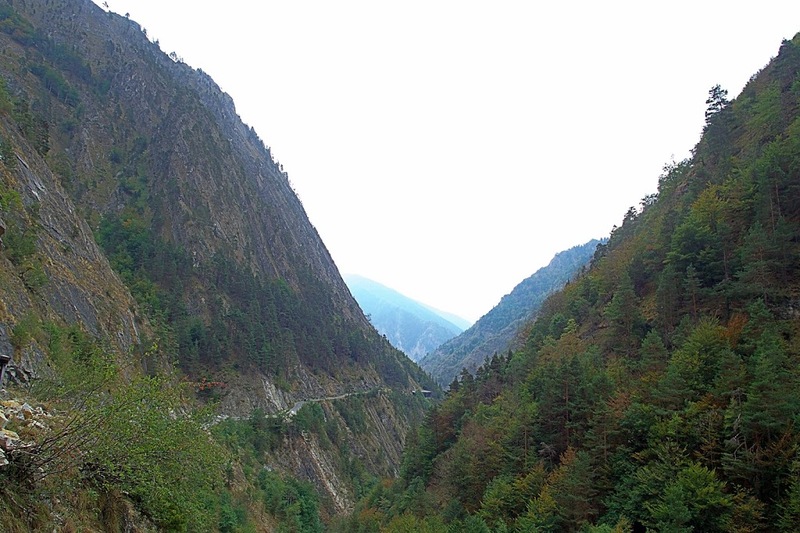 Death road clinging to side of valley. On reaching Stroppo the weather really upped it’s game and the rain became torrential with no sign of letting up, from here our route was to take us back up into the mountains again. Faced with a night of being soaked and cold we headed for a campsite we spotted. Luck was on our side they had an empty yurt hut we could sleep in and even brought us two mattresses to throw our sleeping bags on. It rained heavily all night eventually stopping about 8am the next morning, to say we were glad to have not had to sleep out would have been an understatement. 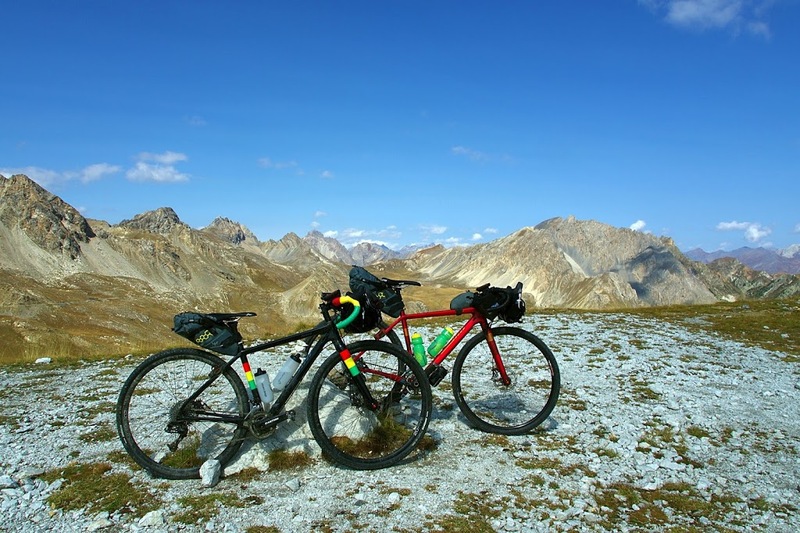 Day 4 Stroppo to Colle di Tenda via little Peru. 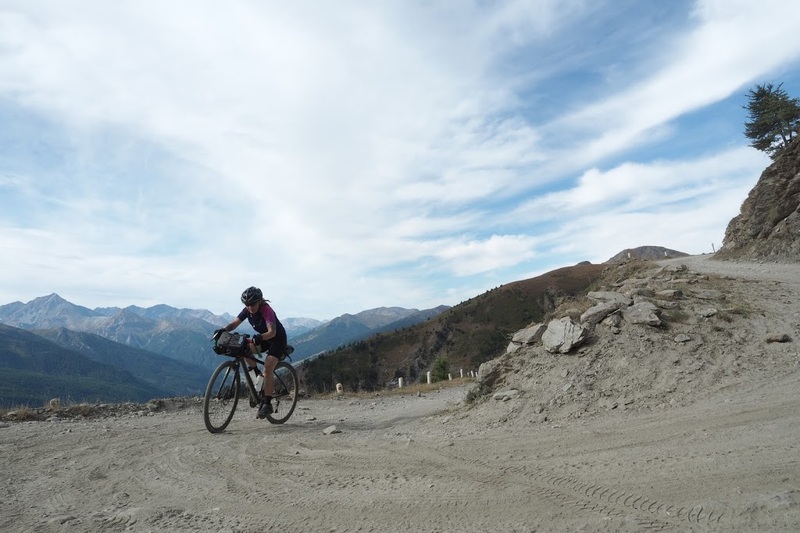 After leaving our yurt we started the long climb up the Colle de Preit (2076m), soon we were stripping off layers of clothing as it warmed up and tarmac became gravel. We climbed past the Refugio Gardetta to reach the high altitude military road which would climb to 2460m and take us to Little Peru. The weather was stunning affording us amazing views as we kept climbing. We passed a few other off roaders en route (Lada Niva anyone!) before we were off and pushing under the gun nests high above the valley that Little Peru is famous for. Four Horsemen of the Gardetta. 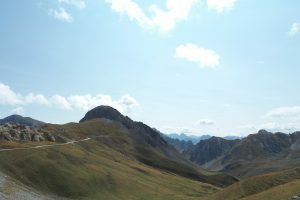 Top of the Altipiano de Gardetta. From here it was more Strada Bianca, more amazingly fun and fast off road descents followed by more road descents. Soon we’d lost all the height we’d spent half a day gaining and were rolling along through valleys and towns heading towards Colle di Tende our last climb for the day. 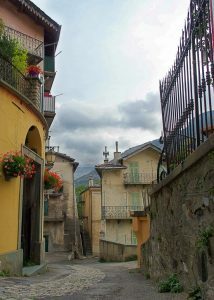 We arrived in Limone Piemonte early evening and picked up some supplies to keep us going that evening as we started the climb up the Colle di Tende. We’d decided to bivvy half way up to give ourselves an easier start the next morning. It was a chilly and misty night with the wind picking up which made for some hard going on the last of the climb the following morning. 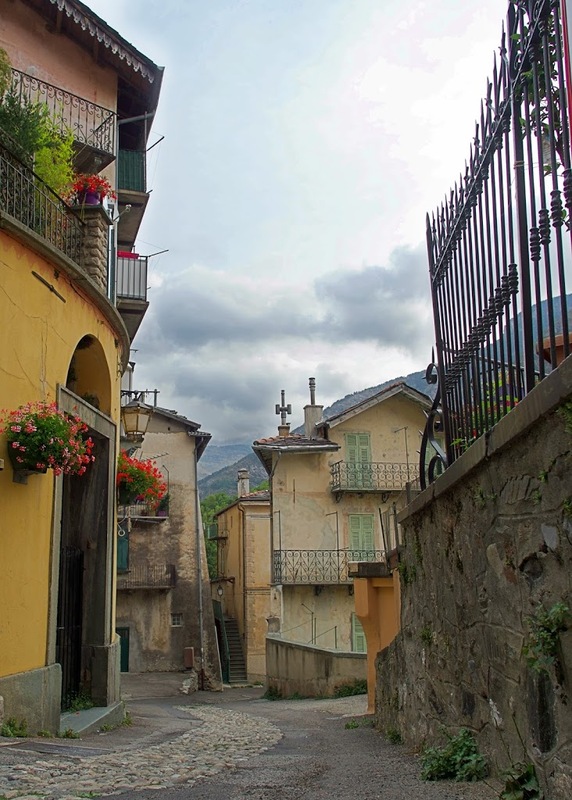 We were however rewarded with the famous dirt switchbacks on the way down before heading off to St Dalmas di Tende and finding possibly the best bakery in the world for breakfast. We were now into our final day with one last big gravel climb (the largest on the rally) up to the Fort de la Forca and Col Turini. The weather was about to break again so we headed off hoping to beat the worst of it. We climbed steadily eventually breaking clear of the tree line and onto the open slopes. Ahead of us was the Fort sitting high on a hill and from here it really was downhill all the way to Nice (about 55kms to be precise). Fort de la Forca in the distance. Just as we reached the Fort the weather broke, we pulled on all our warm clothes and set off on for coldest ride we’d done for a long time. 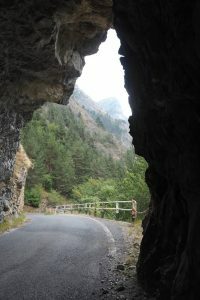 Riding the road used in the Monte Carlo rally in the torrential rain we shivered our way down to the Col di Turini stopping frequently to try and warm fingers, toes and shake uncontrollably. 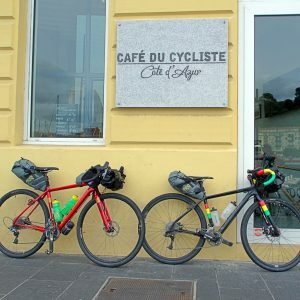 Another couple of hours and we’d made it to Nice, the finish point of the Cafe du Cycliste was now closed so we grabbed a hotel for the night, warmed up in a hot bath and decided to visit the Cafe the following morning to grab our finishers tyres (thanks WTB) and drink some very good coffee. The TNR is a fantastic event, all credit to James the orgainiser for an amazing route and all the hard work he puts in (cue sheets in 3 languages, sorting the pre ride dinner and no doubt answering hundreds of questions from would be riders). 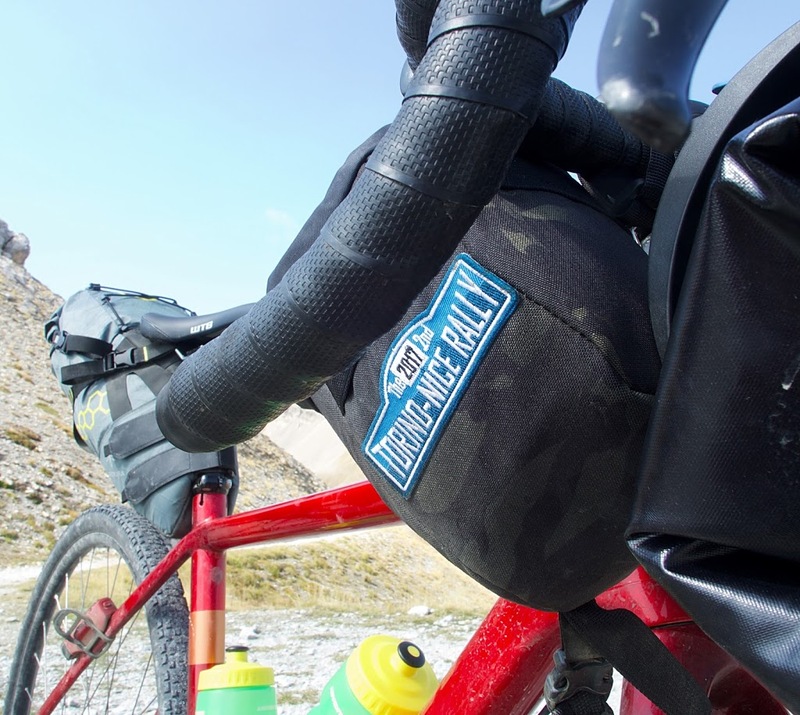 It’s also a not for profit event with all the money from sales of the rally patches and rider donations going to the The Smart Shelter Foundation a project James came across whilst riding in Nepal. The finish point, the wonderfully hospitable Cafe du Cycliste. Park tyre boots – carried for decades, used this time! Used everything- didn’t forget/ miss anything. Previous article	Riding the HT550 (or a big walk with a long bike). 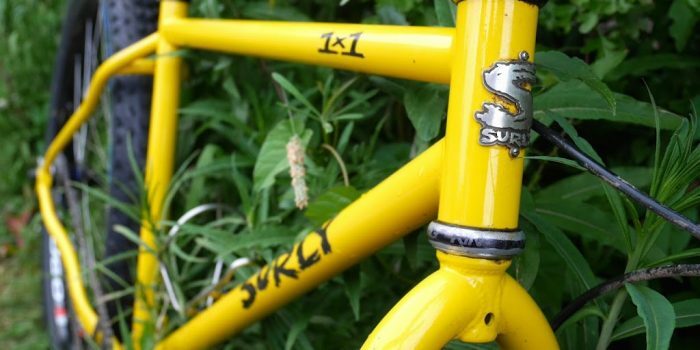 Next article	Love at first ride: Surly Midnight Special. 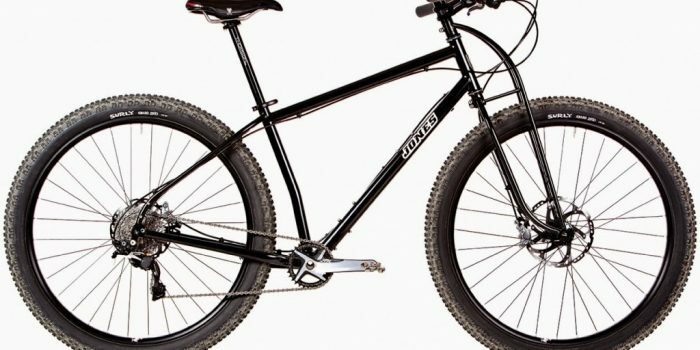 remember the old Surly 1×1?